THE ULTIMATE STREAMLINED TRAVEL BC Lightweight, low-profile design is built with dive-trekkers in mind. In the world of scuba diving, nothing exemplifies freedom of movement better than the feeling you get wearing minimal thermal protections and a bulk-free, back-flotation BC while cruising the crystalline waters of the tropics. Especially if it's a back-flotation BC built specifically for that purpose. The LITEHAWK is the ultimate back-flotation travel BC. Its lightweight, ultra-slimmed-down design and soft, flexible backpack lays flat and compact for packing. The adjustable belt-style waist strap with nylon buckle can be cinched up snug, and the quick-release rotating shoulder buckles that let you route the straps under your arms, plus the two-position sternum strap, hug your body like the BC was custom-made for you. But you can't fully appreciate the LITEHAWK until you get it in the water. With the tank secured by a lower primary tank band, an upper support strap and an adjustable yoke strap, the entire system locks in, ensuring a controlled, stable ride at depth. The BC carries no inherent buoyancy so only minimal ballast weight is required. Consequently, the two non-ditching pockets can be used to carry accessories. Optional quick-release weight pockets are also available, and four aluminum D-rings provide convenient clip-on points for additional gear. The LITEHAWK provides a streamlined package that travels easy and delivers a comfortable, stable ride at depth, making it well-suited for both tropical and temperate water travel diving. Technical Information Compact, lightweight design with soft backpack makes it perfect for dive travel. Constructed of 420 denier nylon for lightweight and long-lasting durability. Low-profile, progressively-shaped rear air cell increases range of motion while decreasing drag. Elastic cords rein in the air cell when partially inflated and help control deflation. Clutter-free ergonomic harness eliminates bulk and enhances freedom of movement. Multiple band and strap system keeps tank secure and increases stability at depth. Three-dump deflation system lets you to dump air from a variety of underwater positions. Adjustable belt-style waist strap with nylon buckle offers a snug fit for any body shape. Rotating quick-release shoulder buckles allow you to optimize the routing of your shoulder straps to maximize fit. Two basic accessory pockets are included. Optional weight pockets are available. Two rear trim pouches allow you to achieve a well-balanced swimming position. Four aluminum D-rings provide convenient clip-on points for additional gear. 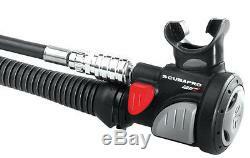 BC comes equipped with a Balanced Power Inflator or an AIR2. Available in three sizes with 29.2lbs/13.2kg of lift capacity. 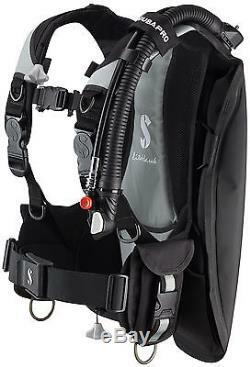 Product: Scubapro Litehawk w/Air2 BCD / Black/Grey / XS/S Brand: Scubapro UPC: SKU: 22.220.154 Weight: 10 lb, 0 oz. Our trained staff of associates are ready to test, setup, and prepare your equipment to ensure you have what you need right the first time. The item "Scubapro Litehawk (2015) withAir2 BCD / Black/Grey / XS/S" is in sale since Wednesday, October 19, 2016. This item is in the category "Sporting Goods\Water Sports\SCUBA & Snorkeling\Buoyancy Compensators". The seller is "outdoorexistence" and is located in Woodstock, Georgia.